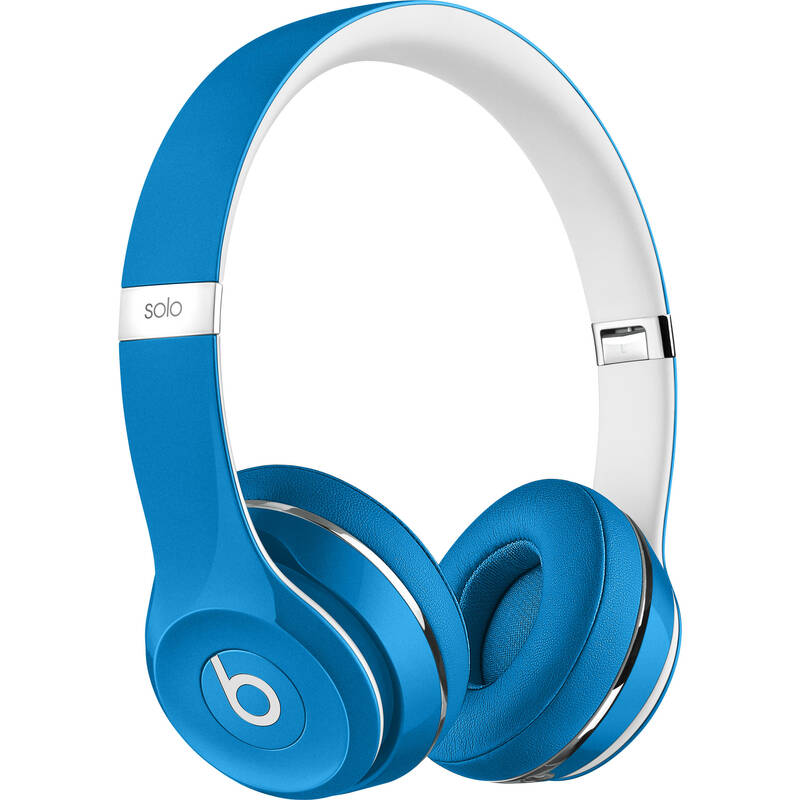 The blue, Luxe Edition Solo² Wired On-Ear Headphones from Beats by Dr. Dre have been completely redesigned to provide improved acoustics and sonic clarity from their predecessors. They feature a flexible headband and ergonomically angled ear cups to provide a comfortable fit, while the ear cup material helps dissipate heat while minimizing sound leakage. Their detachable RemoteTalk cable is iOS compatible, and allows you to control tracks, volume, and take calls on compatible iOS models. A carrying case is included. Box Dimensions (LxWxH) 8.3 x 5.9 x 4.5"
Solo2 Wired On-Ear Headphones (Luxe Edition, Blue) is rated 4.8 out of 5 by 53. Rated 4 out of 5 by Steve from Great headphones at a great price Looking at these for a while for my daughter and everywhere on the planet they are $. Ordered these the other week for $ from BH. Great buy. Daughter loves them! Rated 5 out of 5 by 711 from Dred Beats Solo2 Sounds and look good My son wanted these as a gift. Got Studios first not realizing they required charging to work. Returned and got Solo2's. Much better for a younger person or for anyone not wanting to worry about charging another device. Headset sound quality has good bass and covers all range but I think kids just like displaying the brand. Rated 5 out of 5 by MC6199 from Everything I ecpected and more! Love my new Beats! I replaced a pair that are 3 years old and the sound is amazing. They are so good that they cancel outside noise easily. I also love the new color and updated case. Lastly, they seem more durable than my originals - which I am happy about! Thanks again - for a terrific - hassle free shopping experience. Rated 4 out of 5 by Anonymous from Love them I love the look of these headphones and how the cord is strong and long enough so it's not gonna break easily. The sound is very HQ even though I expected a little bit more. For me I felt that the headphones were pressing my head a bit too tight when I first put them on but eventually it's not that bad. If you are thinking of buying these headphones, buy them from here. The prize and the quality are good and delivery just super fast. Also the whole package of dr dre headphones is just neat. It's fun to open it. Rated 5 out of 5 by Anonymous from Awesome Headphones! I love the black color! The headphones are engineered beautifully and they feel great over your ears! Very stylish and attractive headphones! Are they new? Or used? The Beats by Dr. Dre Solo2 Wired On-Ear Headphones (Luxe Edition, Black) (B&amp;H # BES2LEOEHBLK) have been discontinued, and are no longer available at B&amp;H.
There s no a cable line !!! Whats wrong with this? A RemoteTalk iOS Cable is included. Does it come in all the original packaging? Yes! It comes in a steel box and in a protective case made of leather-ish material. Do they come with the beats box? Yesit will be shipped to you with all included BEATS accessories and in the factory box:All products purchased at B&amp;H are brand new in the original factory box including packaging, all factory included accessories and factory warranty, unless otherwise stated to be USED, Refurbished, Open Box, or Demo. No, they are not wireless. is the bests solo 2 compatible with android devices? Are they wireless or BT?